BOB BURNS. Hope my opinion doesn’t step on to many toes, because I do love Ed Hardy’s tattoos and art. Just food for thought. Speaking of food don’t eat to much over the holidays, or what the hell do what ya want!!! Happy Holidays. p.s. I’m saving my money for a Patumwan springer instead of buying these over priced Ed shirts. A much wiser use of money. Why are people downing Ed Hardy? Hardy’s the nicest, most respectful person you’d ever want to meet. Licensing his artwork for the Ed Hardy clothing line is a way to make tattoo culture more prevalent. Or should we keep it to bikers, criminals and servicemen as it was in the 60’s? When Ed Hardy started tattooing, there were about 500 people doing it. Now there’s over 50,000. Many people owe their lifestyle and fame to what Hardy helped build, to the rise of the modern tattoo culture. A $62 shirt is not expensive, look at some italian designers with $200 t-shirts. When you buy Ed Hardy, you wear art. The art has an intrinsic value and a history. When you buy Gucci, you buy a logo. Hardy’s a scholar-level historian on Asian art and the first American ever to be “let into” the Japanese tattoo world. Give your props to the most important man in tattoo, who is also the humblest man I’ve ever met. If you don’t want to buy a tee, don’t. 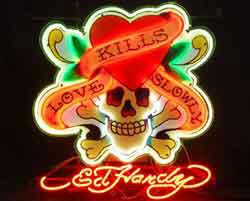 Props to Ed Hardy!!! No props to overpriced bad quality T-shirts. and we will see how this style will be famous enough ….. I like the Style form Ed Hardy and Christian Audigier. THERE IS A METHOD TO ED HARDY’S MADNESS ! YOU CAN WEAR ED HARDY PIECES FROM HEAD TO TOE BUT YOU MUST BE A TALENTED DRESSER, NOT EVERYONE HAS THE KNACK ! FIRST AND FOREMOST A PERSON INTESTESTED IN WEARING ED HARDY AND CHRISTIAN AUDIGIER CLOTHING SHOULD DO RESEARCH AND INTENSIVE STUDYING . THIS WAY THE CONSUMER HAS AN ADVANTAGE, THEY CAN STUDY THE TATTOO AND THE DIFFERENT STYLES. THAT WAY THEY WILL DISCOVERY WHAT TATTOOS AND WHAT STYLES FIT THEM BEST ! THERE WILL BE A LOT OF TRIALS AND ERRORS BUT IF THEY LIKE THE TATTOO STYLE IT IS BEST TO KEEP UP WITH IT. FOR INSTANCE CA STYLE OF CLOTHING DO NOT COMPARE TO ED HARDYS. CA HAS SOME NICE SIGNTURE TATTOO SHORTS AND DRESS BUT HIS STYLE SUFFER BECAUSE THERE SIMPLY IS NO DIRECTION AND AT TIMES IT GET GAUDY AND GHETTO ! ED HARDY STYLE IS VINTAGE , AND IT IS A DISTINCT COLLECTION OF TATTOOS THAT IS KNOWN INSTANTLY BY ANYONE WHO KNOWS ED HARDYS DESIGNS. ED HARDY CLOTHING ARE COLLECTOR ITEMS, YOU NEVER GET RID OF THEM YOU ADD TOO THEM LIKE BASEBALL CARDS. SOME BECOMES RARE AND ARE SORT AFTER BY COLLECTORS. SOME TATTOOS NEVER MAKE IT TO THE PUBLIC AT LARGE ! ED HARDY DESIGN WILL NEVER GO OUT OF STYLE, IT IS SIMPLY IMPOSSISIBLE. HIGH END CLOTHING LIKE LV , CHASE DOWN FAKES, EH DESIGNER LOVE IMITATORS, IMITATION IS THE SINCEREST FORM OF FLATTERY . IT IS A DESIGN BY THE PEOPLE AND FOR ALL OF MANKIND !